This Wednesday, DLL at P.S. 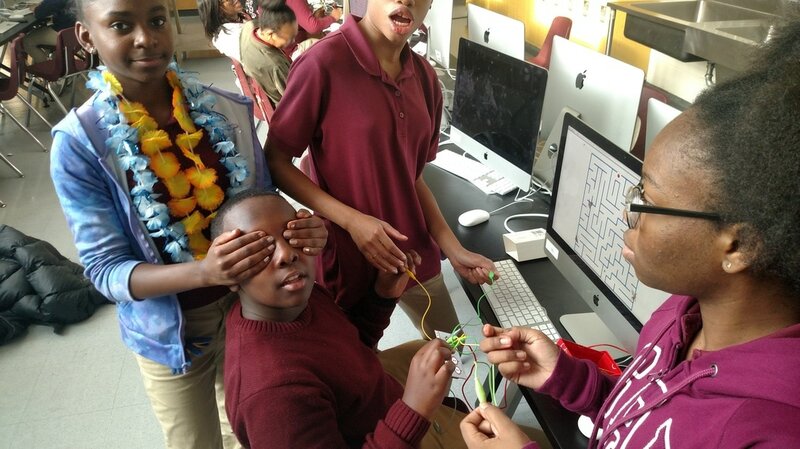 109 added a very hands-on component to its game design curriculum with the introduction of Makey Makey controllers to students’ work with Scratch. Makeys resemble an old-school Nintendo controller – two buttons and a four-way directional pad – with one significant difference: each of the six inputs require an electrical circuit to function. 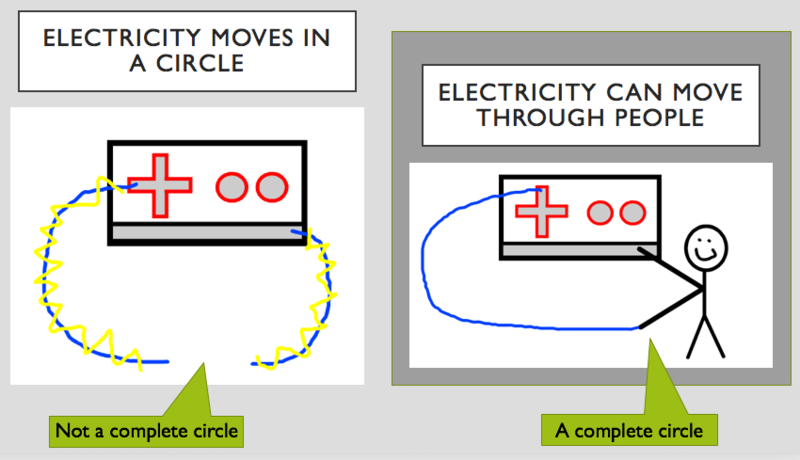 In other words, students must link their hands and a wire connected to the controller to form a circle of electricity and make each button work. After some initial “fun” convincing the students that touching the wires would in fact result in a mild electric shock, trainers Matthew, Cheyenne, and Antoineta got serious and broke the students into groups, with students holding wires connected to the left, right, up, and down buttons, and one student acting as a “controller,” grounding themselves on the Makey and choosing when to touch other team members to complete a circuit and move in that direction. We challenged groups to race against each other through the levels of the maze and find the most effective ways of communicating within the group about who needed to complete a circuit to move in a particular direction at a particular time. Some students made the process a little harder than it needed to be! All in all, students enjoyed the break from programming and, while having fun with the Makeys, also got a taste of level design and teamwork. We look forward to seeing what kinds of games they create on their own!